Nearly every country in the world has legislation to regulate electronic invoicing. 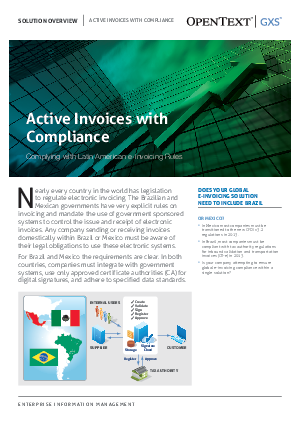 The Brazilian and Mexican governments have very explicit rules on invoicing and mandate the use of government sponsored systems to control the issue and receipt of electronic invoices. Any company sending or receiving invoices domestically within Brazil or Mexico must be aware of their legal obligations to use these electronic systems.